If it’s digital, it can be uploaded, downloaded, shared, edited and embellished. With advances in 3D printing technology, internet accessibility may soon apply to physical items too, including over-the-counter drugs. 3D printers have existed since 2003, and are already in mainstream use for the production of industrial and medical components. Similar to a regular inkjet machine, 3D printers follow digital instructions to produce a physical copy of an item. This is done by precise layering of materials such as plaster or plastic to build up a 3D structure. Demonstrations of the technology have seen 3D scans taken of various items (including an Academy Award statuette and some particularly tasteful gargoyle figurines), then replication of those items in various materials. There’s more to 3D printing than just copying trinkets though. The potential to perform pre-programmed chemical reactions could turn home offices into small-scale laboratories. Recent work at the University of Glasgow has demonstrated the capacity of relatively affordable 3D printers to act as tools for performing chemistry. Reaction vessels were ‘printed’ in layers of quick-setting bathroom sealant, and the chemicals required for the desired reaction were ‘printed’ into those vessels. By preparing a digital blueprint for, for example, the production of paracetamol tablets, a specialised chemistry set could be printed out, and a choreographed reaction performed with minimal human input required. The end product would be freshly produced painkillers, essentially downloaded from the internet. The trials of this technology were carried out using a commercially available 3D printer that cost around US$2000. For that sum of money, and the additional cost of buying reaction ‘recipes’, any household could become capable of producing their own non-prescription medication. Before this use of the technology becomes commercial, issues of user safety need to be addressed. A printed chemistry set would have to be impossible to adapt for illegal uses; it’s not hard to imagine digital recipes for preparing illicit drugs being shared online. The reactions that could be performed would be limited by the availability and safety of the chemical ingredients. Despite these hurdles, 3D printing and desk-top chemistry might be the next advancement in bringing goods and services into homes. If you were lucky enough to be streaming the footage of the NASA control room on the afternoon of the 6th of August, you would’ve witnessed NASA scientists dancing, hugging, high-fiving, and crying with joy. They had every reason to be over the moon; their US$2.5 billion Mars Science Laboratory rover, Curiosity, survived a deceleration from 21,000 kilometres per hour to sit comfortably stationary in a dusty crater hundreds of millions kilometres away from Earth. Getting to Mars is expensive and labour intensive, but the data Curiosity will send back to Earth could change our understanding of life in the universe. It’s understandably difficult to get to Mars. The Red Planet is pretty far away, varying from about 50 million to 400 million kilometres from Earth, depending on both planets’ orbits. Since the 1960s, NASA and the former Soviet Union have been launching satellites and landers in the general direction of Mars, and out of 39 launches, only 20 have reached their destination. Of those 20 successes, 7 have been actual landings on the planet’s surface. The other 13 were satellite missions, providing images of the Martian surface from low orbits. In 1976, NASA’s Viking 1 landed on Mars and sent back the first images from the surface of the planet, in fact, the first images from the surface of any planet other than Earth. NASA launched their second successful mission to Mars in 1996, with Pathfinder and its on-board microwave-oven-sized robot companion Sojourner landing on Mars in 1997. Sojourner was the first wheeled robot on Mars. It rolled around and collected images and data that suggested that Mars was once an ideal location for life to develop; warm and covered in water. It wasn’t until 2001 that the Mars Odyssey probe discovered ice under Mars’s dusty surface; the first physical evidence of water on another planet. Twin rovers Spirit and Opportunity landed on Mars in 2003, and found further evidence of ancient waterways on Mars, including mineral deposits associated with free-flowing water. In 2008, the Phoenix rover observed snow falling from Martian clouds. Now it’s Curiosity’sturn to find some microbial life in amongst all that Martian water. Curiosity is about 3 metres long and weighs 900 kilograms, with a top speed of 90 metres per hour. It is equipped with 17 cameras, and an array of instruments for analysing the content of mineral and soil samples. Its objectives include identifying traces of chemicals that could indicate life, determining how soil and rocks were formed, and establishing a time-scale for the development of the Martian atmosphere by measuring levels of carbon dioxide and other gases. Curiosity will be spending two lonely years on Mars, before shutting down. If evidence of life is found, Mars could well be an environment in which humans could survive. It seems like the stuff of science fiction, but manned missions to Mars might not be too far behind Curiosity’s trail-blazing. 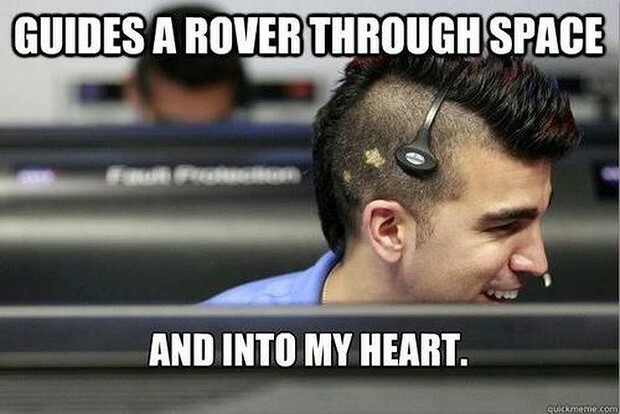 You can follow Curiosity on Twitter, @MarsCuriosity, or you can find Curiosity’s abusive alter ego, @MarsCuroisity. Both are worth your time. Crowd-sourcing is becoming a powerful force. Enlisting hundreds of thousands of people to complete tiny sections of a larger task is so efficient, you might not even know you’re already participating. Every time you fill out a ‘reCAPTCHA’ box to verify that you’re not a spambot, you’re actually helping to digitise books for ever-expanding digital libraries. In just one day, 200 million ‘reCAPTCHA’ boxes are filled out, amounting to over 150,000 hours of work per day. Whenever you’re asked to type the squiggly words ‘basilisk dissuade’ before you can download a document or tell someone on the internet that they’re wrong, you’re completing a fragment of a huge puzzle. The awesome might of crowd-sourcing has found its way into the world of science in the form of a game called Foldit. Foldit was developed in 2008 after David Baker, a protein research scientist at the University of Washington, realised that humans are, in fact, better at spotting complex and creative solutions to scientific problems than computers are. A recurring problem in the world of protein engineering is identifying the best possible structure for protein molecules to fold into. In order to better understand the inner workings of organisms on a molecular level (and learn more about illnesses and their treatments) researchers need to be able to visualise the correct folding patterns of long and complex protein molecules. Sometimes computer modelling alone cannot determine the most efficient folding pattern of a protein. Baker’s plan was simple; to develop a puzzle game that could be downloaded for free, feed current protein structure problems into the game, and watch as hundreds of thousands of players came up with unique and creative solutions. The Foldit game presents players with a section of a protein molecule that computer modelling has been unable to arrange into the optimum orientation. Players are given instructions to rotate and bend different parts of the protein section to match certain criteria, and then can submit their attempts. These attempts are collated and compared by protein researchers, and the best possible structures are further investigated. This isn’t just a little puzzle game designed to help students procrastinate; real scientific results have been reached using Foldit players’ suggestions. Most recently, a computer model of an enzyme capable of aiding in a Diels Alder reaction (a common chemical step in the synthesis of various compounds) has been completed thanks to the input of Foldit players. Players who are particularly active or advanced have even been named in published papers as contributors to the research. By approaching the protein-folding problem with an accessible and fun format, scientists have harnessed the power of hundreds of thousands of human minds to tackle big problems, one small step at a time. In August of this year, Washington will be hosting an event that will no doubt capture the imaginations of scientists and sci-fi nerds alike; The Annual Space Elevator Conference. Over the course of three days, researchers, designers, and space enthusiasts will meet up to discuss the challenges of constructing a US$8 billion ribbon that will connect Earth and sky. The current design consists of a tether fastened to the Earth’s equator, extending to a counterweight about 96,000km away (a quarter of the distance to the moon!). Elevator-riders’ destination will be a space terminal sitting at 36,000km above Earth’s surface. To put this distance into perspective, NASA grants astronauts their space travel wings at an altitude of 80km, Virgin Galactic will take you to 110km for the small sum of US$200,000, and Earth’s atmosphere ends at an altitude of about 1000km. The cable, counterweight, and terminal will orbit Earth as the planet rotates, with the terminal itself existing in ‘geosynchronous orbit’; essentially orbiting at precisely the right distance and velocity to ‘keep up’ with Earth’s rotation. Getting to 36,000km in a space elevator will involve more than just hitting the ‘up’ button and standing awkwardly in a box, desperately avoiding eye contact with fellow lift-users. Travelers will be zipping along the Earth-to-space tether at 200km/h for about a week, contained in a shuttle capable of deflecting potentially fatal radiation. For the past five years, NASA has been offering a US$2 million prize to groups that successfully develop a tether capable of withstanding the physical demands of space elevator travel. No group has won this NASA Strong Tether Challenge yet, but 2012 might be the year that changes. Developments in the technology have put carbon nanotubes at the front of the materials-race for space elevator application. Consisting of a ‘mesh’ of carbon atoms rolled into a cylinder of about 1 nanometer diameter, carbon nanotubes are the strongest known material in terms of tensile strength (withstanding stretching or pulling). Carbon nanotube fiber with a cross section of 1 millimeter squared would be capable of holding about 6400kg. That’s like dangling a Hummer from a ukulele string. Using this super strong material, the ‘ribbon’ space elevator tether design becomes feasible. A 20cm wide, paper-thin ribbon of carbon nanotube fibers would be sufficient to link Earth to the space terminal, before widening to about 1m to join the terminal to the counterweight. Before the development of the space elevator can commence, a method for seamlessly joining carbon nanotubes together to form a 94,000km ribbon must be perfected. Spinning fibers together like spinning yarn from wool might be an option, but there is no room for shortcuts where a project of this scale is involved. The Obayashi Corporation in Japan has announced that they will be capable of building a space elevator within the next 40 years, so there’s every chance we will be lucky enough to witness one of the staples of science fiction becoming a reality.